The Bachelor in International Food Service Management will prepare you for a career as a food service expert, able to work in a range of environments, from fast to traditional food, street food to gastronomic restaurants, franchises to independent outlets, and from commercial to institutional catering. In Europe, 1 meal out of every 5 is eaten out of the home. New lifestyles, societal changes and the increasing needs for services to the person have all made food service a strategic sector. Our 4-year course will allow you to study the whole food service value chain: suppliers, distributors, restaurant owners and consumers. This course is for you if you’re a natural leader interested in all categories of food service. If you’re also passionate about digital technologies and constantly on the look-out for innovations to improve the quality of customer service. Tomorrow, you’ll be equipped with the skills to successfully adapt to changes in consumer habits, guarantee the profitability of your establishment and increase the satisfaction of your clients. Our learning approach is unwaveringly innovative, inspired by the “test & learn” philosophy, offering students both a strategic and operational perspective of the industry. 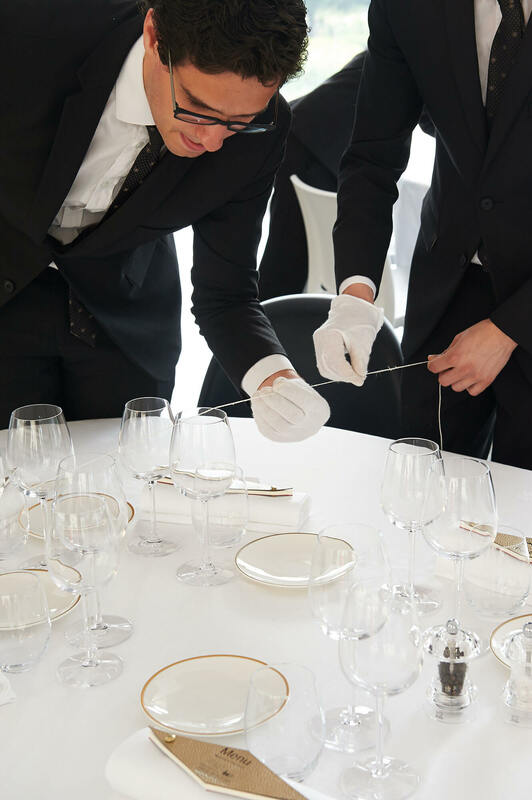 50% of your course will involve practical professional training in our hotels and training restaurants. You’ll develop a clear and in-depth vision of each segment of the food service industry, along with the demands of culinary production and regulatory requirements. As the course advances, you’ll progressively gain confidence as a manager, preparing you for rapid career progression. Equipped with the team, leadership, communication, analytical and decision-making skills expected by employers, you’ll be able to work effectively with kitchen teams as well as service teams and suppliers. I remember serving a group of clients who had come to our restaurant for their Christmas dinner. I endeavoured to meet their expectations concerning the pairing of food and wines, and at the end of the meal each client shook my hand with a big smile. After being congratulated by them, I overheard my maître d’hôtel telling them that I was the best trainee he had ever had, which made me really happy! Our specialisations will enable you to develop a more flexible approach to management and equip you with a specific domain of expertise. Choose to be unique – true to the vision of our founders, we are the only school in France to offer an undergraduate programme dedicated to food service. Discover a myriad of new career opportunities. 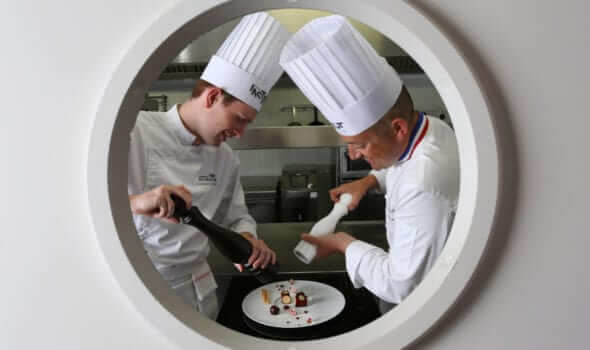 At Institut Paul Bocuse, you’ll be able to display your talent whilst working with the very best, including a multiskilled team of 150 industry professionals and leading professors. You’ll be able to try out your skills in a unique training environment offering a 5-star hotel school, a campus-based hotel and 6 training restaurants. Benefit from our partnership with the Université du Vin (Wine University) located in Suze La Rousse. You’ll follow a comprehensive 60-hour training programme covering all aspects of the wine industry. Further your expertise by choosing one of the specialisations available in Year 4. Build yourself an inspirational and international future: 80% of our graduates’ first jobs are as managers. Nearly 70% begin their career overseas. Upon completion of this course, you’ll be awarded a Bachelor in Food Service Management and the Professional Certificate in International Hospitality Management, registered with the National Repertoire of Professional Certifications (RNCP) at level II (Bachelor). 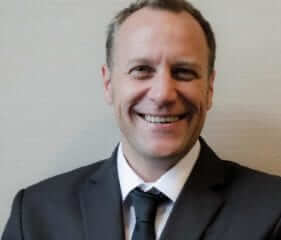 Jean-Michel Dixte has all that he could wish for in his job, which takes him to the four corners of the earth. This brilliant food service management professional is totally committed to his mission of creating new restaurant concepts for the Hilton Worldwide Group. 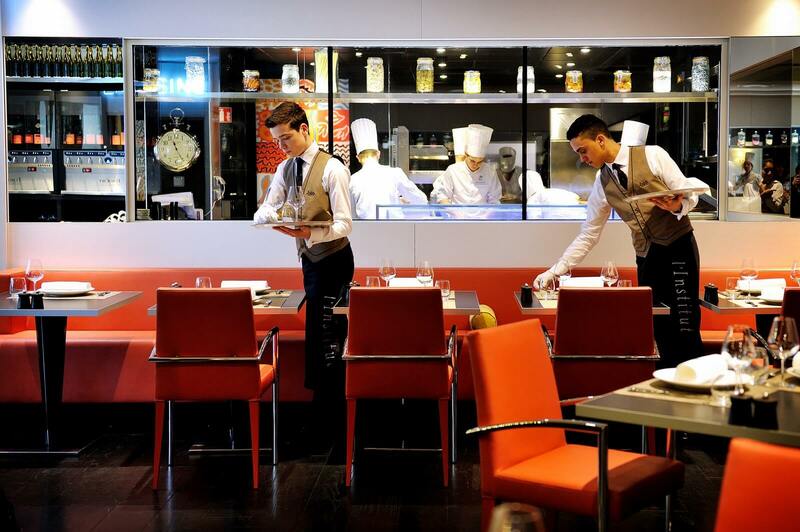 Our scholarships and bursaries are awarded by the G&G Pélisson Foundation for Institut Paul Bocuse.